from Jeffrey Hamelman's Bread. One of Mellow Baker's June Challenge. 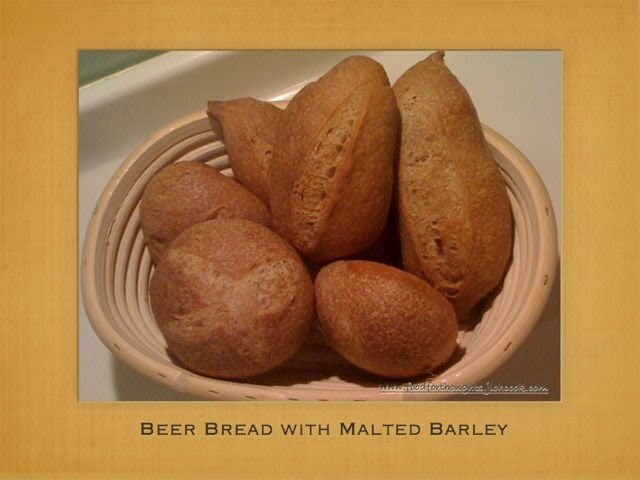 Made with Guinness Stout which seems to be the favorite beer used by members or perhaps more because of the convenience of availability, and Diastatic Malt Powder that was imported from US. I also adjusted the amount of Whole Wheat Flour because mine seems darker than others that I've used before. Unsure of the taste, I made 1/3 of the recipe in the book, in case no one likes this bread. I was in for a pleasant surprise. 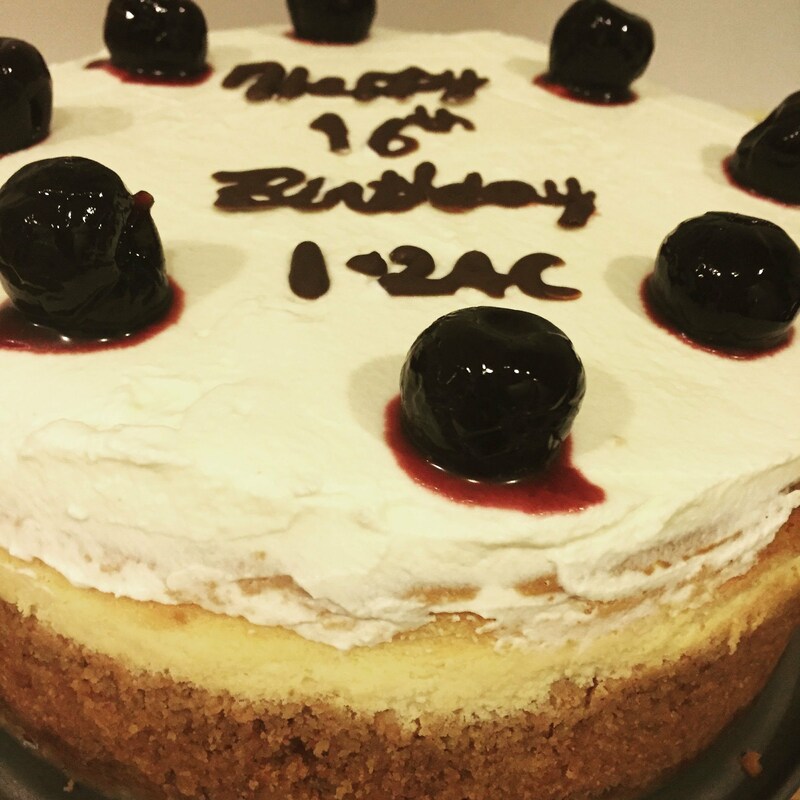 In the world of mellow bakers, there's no such thing as late. I'm into the first week of July and still baking the June's bread. 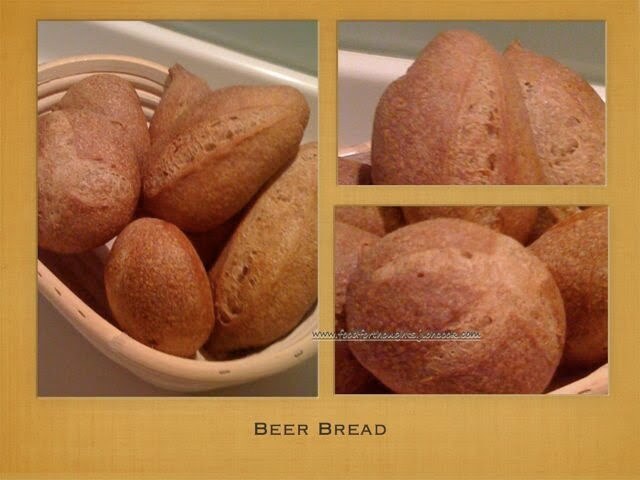 Well, this is 1 bread that I won't want to miss because it has beer in it. I was curious to find out the taste of this bread. I've made stewed beef with guinness stout before, I love the taste of it, as it brings out the sweetness of the beef. So, how can I miss this challenge. For the past few weeks, I've been trying to sprout my own barley, but with no success. I've been going to every other supermarkets, dried food stores, looking for wheat berries (with husk), no chance, they only have wheat berries probably process ready to be cooked. I tried to ferment it, it got fermented but didn't sprout. I gave up after the 2nd try. I forgot that I've asked my friend to order diastatic malt powder when she was in US. I have 2 pounds of the flour. And I realised that I could use it. Perhaps its not as roasted as per the book, but still, I guess it'll do. My guinness stout had been sitting in the fridge for 3 weeks, waiting to be opened and used. Finally, with Germany vs Argentina quarter finals for 2010 World Cup, I was ready to open the bottle. Mix well, and cover bowl. I put it in my living room which is cooler. I had my aircon on for 24 degrees celsius, but I think it was more like 25 degree celsius. So, 4 hours, it had bubbled very well, and seems to be doming in the middle. If I had waited for 12 hours, I would have passed the prime of using it. I decided to work with the poolish then. Mix all, including poolish. I had to add a little more flour as I was kneading as I added a little more beer and water than needed, not on purpose. I kneaded probably for a good 15 minutes till the dough felt smooth and extensible. I decided to give an every half hour of stretch and fold, as I want this bread to be soft and well developed. I did the stretch and fold 4 times in 2 hours. I saw someone did rolls with this dough, and I decided, I wanted small rolls too. Not sure how the taste will be like, I didn't want to make a big loaf. Every roll about 65g each. 4 of them, I rolled it round, 4 of them I made mini baguette style (practising my baguette shaping in preparation for the next challenge). Germany is winning the game, and there was no way Argentina was going to get any goals in. The whistle blew, and Germany won this quarter finals. They played really really well. I decided to stuck my rolls into the fridge. Time to go to bed. I will not be waking up to watch Paraguay vs Spain. Its 7.30am, and I'm thinking about my dough in the fridge. I woke up and heated up the oven. Made myself a cup of coffee while the oven is heating up, and turn on the TV. Oh, they were showing the Paraguay vs Spain match, how timely while I do my baking. I heated the oven at 250 degree celsius, and 10 minutes before the oven is ready, I poured a cup of water into the pan. I got the dough out from the fridge and score them. Did a cross for the round ones. My oven was too small to put all 8 dough, I decided to bake the round ones first. First 6 minutes after the dough went into the oven, I spritz water into the oven 2 times in interval of 3 minutes. Baked for 18 minutes and I left it in the oven for 7 minutes to dry out with the oven door a little ajar. By the time I finished baking the 2nd batch, Spain finally scored, after missing a penalty. At least Spain is gaining grounds. The whistle blew and Spain won. This bread is sweet, while baking, I could smell the stout from the dough, probably the alcohol is evaporating while baking. The sweetness leaves a nice after taste. The crumbs were well developed, soft and bouncy. The crust was crispy and not too thick, chewy. I regretted that I only made 1/3 of the recipe, because everyone seem to like this bread better than most other breads. Perhaps my skills are getting better? I do like to think so. Initially, I took out my swiss cheese to have with this bread, wrong choice, I decided to go for my Vermont Cheddar Cheese, yum yum....the taste is right. 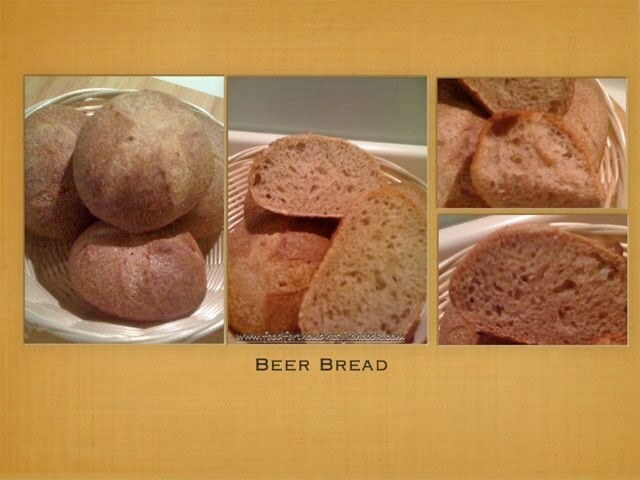 Beer Bread in celebration for Germany and Spain who won! Who will go on to be the final team in World Cup 2010?